As Tony's eyes opened and gradually became accustomed to the light, he felt a lot better than he had in quite some time. That warmth he'd come to believe was normal had subsided; the headache had gone away; and, wonder of wonders, he was hungry, more hungry than he had been in days! He looked around for a garbage can, but instead found an open dish of some kind of mashed meat, right next to a bowl that had somehow filled with rainwater. This was too lucky to be believed. Tony eyed the dishes carefully before he ventured a sniff at the meat. Chicken! And . . .and . . . was that Salmon? It smelled delicious. He emptied the bowl ravenously, and washed down the splendid meal with great tongue fulls of rainwater. “Tony, somebody wants to meet you.” Gentle human hands opened the cage and reached for the cat. Tony stiffened. The only hands he'd ever felt were cruel ones. He retreated. “Come on, Tony. Don't be afraid.” The voice sounded gentle and (what was that word?) kind. It sounded kind. Tony relaxed as the hands touched him and carried him out of the cage. He felt the softness of the woman holding him. From somewhere deep inside his body, he felt a rumble; then another; then a third, and Tony knew, for the first time in his life, he was loved . . .
while people at the shelter tried to find Dani a permanent home. Time went by and eventually, the government shelter decided Dani had gone too long without adoption and had become a liability, so they euthanized the perfectly healthy but unwanted little cat. Jean walked away from the shelter forever. There had to be some other kind of shelter, she thought, one that doesn't euthanize for convenience, one that values the lives of every animal, one that offers unwanted pets joy instead of fear, treatment instead of pain, a life of love, even if it may be a short one. In the Fall of 2003, Jean, along with Shanna Hedke, Valentina Papenfuf, and others, established Angels With Paws on the site of an old restaurant named Pinks in Lakewood, Colorado. Their first task was to take out the mops and brooms and clean up. “Old restaurant grease just doesn't mix well with cat hair,” she said, remembering those days of hard work. Once the building was clean, rooms had to be constructed. On the first floor, they put up a double door entrance for the security of the animals. Next, nine rooms were constructed, each one with themed decorations correlating to the exotic names they were given: Egyptian Temple, Seashore, Enchanted Forest, English Garden, Barnyard, Aztec Rainforest, Arctic, Under the Sea, and Pandora. These rooms were designed by two very talented artists, Kitty, and her daughter, Kat. I guess only true cat lovers could have such nicknames. Kitty and Kat volunteered their time to paint and decorate those wonderful rooms. Sadly, Kitty is no longer with us, but her loving kindness will remain a part of Angels With Paws forever, shining in those rooms, and in the eyes and hearts of the cats who live there. A second floor houses animals requiring isolation, with separate rooms for Upper Respiratory Infection, Ringworm, and those who test positive for Feline Leukemia. Veterinarian of Record, Dr. Janet Taylor of Aspen Ridge Animal Hospital, examines every animal at the shelter and quarantines those who may have contagious illnesses. Jean's vision for Angels With Paws has always been as a non-profit community service organization. As such, they provide information on such important issues as Responsible Pet Ownership, Declawing, and especially the need to spay/neuter pets. To this end, Angels With Paws works with Spay Today and Francis Veterinary Hospital to offer this service to adopting families for the best possible price. Another important part of the shelter is its Hospice Service. Dealing with mortality of humans is a difficult responsibility requiring special dedication, but one can only imagine the amount of inner strength needed to comfort animals in their last days. Ms. Lori Root is such a person. She took care of a dying animal once, mourned its loss, and found solace in knowing she had done all she could to make its last days comfortable. That was five years ago, when Lori learned she could never turn away from an animal in need. “It would be the same thing as putting a relative in a nursing home, all alone, and never coming back to visit. I wouldn't want to die like that; neither would you,” she said. Since then, she's been helping pets find peace and dealing with her own heartbreak at the same time. Once she said goodbye to four beloved pets in two weeks, but she got over the grief and continues to care for the pets who need her so very much. 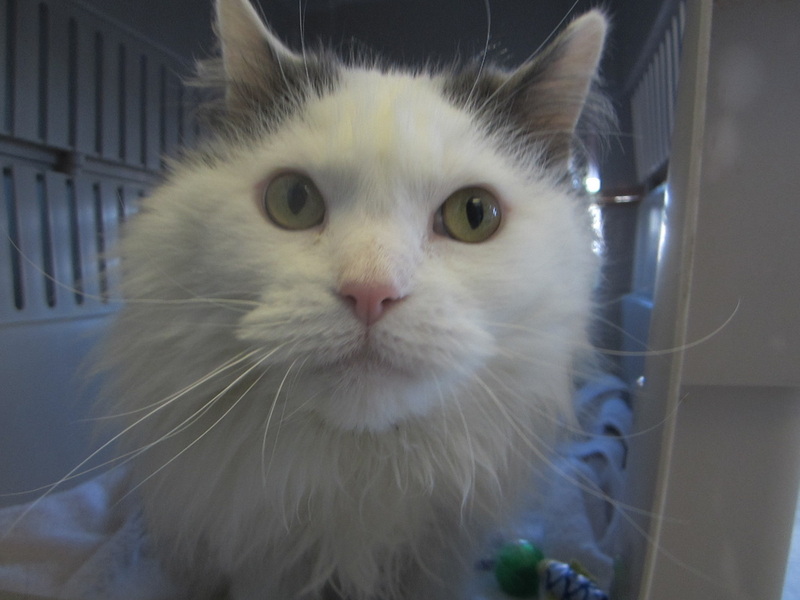 I toured the facility one afternoon recently, and was greeted by Tam, a not quite adoptable cat who, I was told by a staff member named Patti, weighed only four pounds when she came to the shelter. Today, Tam weighs 14 pounds, and even with an auto-immune disease, is a happy little mascot who sometimes loves so much that she bites. Patti introduced me to Chester, a friendly white and tan cat with a round happy face, who is featured on the Angels With Paws web page. Chester is recuperating from a broken pelvis and subsequent nerve damage. He still needs help evacuating, but none of these things seem to have dampened his spirit. He remains spry, even with a tail that drags along the floor. And I saw Jordan, a sweet little red cat who rolled over on his back to get Patti to scratch his tummy. Jordan has cerebellum hypoplasia, probably because his mother had distemper when he was born. He moves a little jerkily and sometimes loses his balance, but he seemed like such a sweet and happy animal . . .
A different shelter would have euthanized these cats. Angels With Paws nurtures them. Since Jean Ausenbaugh founded Angels With Paws late in 2003, nearly 9,000 pets have found loving homes. Although the shelter does not have room for dogs, Angels With Paws has a number of kind associates who are willing to provide foster care, leading to adoption through the agency. A few of the area Petcos and Petsmarts have also fostered adoptable pets. Jean's vision is a noble one, but it requires a lot of work and a lot of help. Vaccines and medicines are expensive, not to mention food and other necessities. The shelter's funding comes from private donations. No corporations or endowments have supported them thus far. Last year, Angels With Paws agreed to team up with Colorado's newest cat organization, Econo Cat Club of Denver, earning additional funds at cat shows and jointly sponsored activities. Itself a non-profit organization, Econo Cat Club is doing all it can to support its good friends at the shelter and encourage the welfare of cats everywhere. volunteers from the shelter. All the paperwork and entry forms had Angels With Paws Logos featured as prominently as the TICA logos. Econo's web page, business cards, and stationary also featured logos and links. Donations to Angels With Paws were requested as spectators arrived rather than strict admission fees. Venders were encouraged to donate raffle items in lieu of table fees, and the shelter was able to hold several raffles and a silent auction from the free eight table vender space where they displayed both raffle items and cats for adoption. Econo Cat Club was fortunate to have Adriana Kajon, a Judge of Merit and Genetics Instructor, in one of the rings. Adriana was kind enough to to share her expertise with interested spectators during a break, explaining all she could about each cat the shelter had brought, and entertaining the audience as well. Cooperation between the two groups was in no way one-sided. 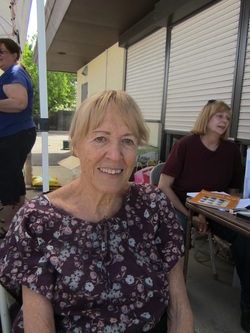 Patti, who supervised the Angels With Paws Volunteers and acted as liaison between the two groups, seemed to be everywhere at once, helping set up the show, moving tables, assigning volunteers to various tasks and tables during the show, working at the Angels' tables, cooking with the kitchen crew at lunch, and even persuading her beautiful daughter to clerk for one of the judges. January's show was a huge success for Econo Cat Club and Angels With Paws, a success both groups plannned to surpass at future shows. In the past four years, Angels With Paws has doubled its space. Last year alone, 1500 cats were adopted. Angels was able to open a Thrift and Gift shop in a separate building the the other side of town that relies on donations to help keep Jean Ausenbaugh's dream a reality. And as for Tony . . .
Tony lived half a decade with the family that had adopted him, learning to play with those fuzzy toys and curling up contentedly in warm, loving laps. He learned, too, how to give back all the kindness he had received, and he purred more and more . . .and when the great dark curtain of eternal rest closed around him, only the memory of his moments of love went with him and brought him peace . . .